1. “A new twitter.com is coming” – so what does that mean? It was only a matter of days ago we spoke about a new Twitter programme, set up to test some new conversation-based features. The news was announced in – no surprises – a Tweet, which went on to explain that a load of new features/design changes are starting to roll out. Some users have even been able to opt-in already. If you’re an avid Tweeter, you’ll be used to the main activity section being on the right-hand side of your screen. In the new layout this is flipped. There’s also an upgraded and more prominent Trends section. I’m not sure if I would go as far as to call this a “new” Twitter to be honest… more like a made-over Twitter with a bunch of new features. Anyway, it will be interesting to see how users respond. Just before Christmas, we took a look at Pinterest’s 2019 trend predictions. Based on search volume increases, the platform can accurately predict what’s most likely to gain traction in the coming year. This kind of insight is like liquid gold to marketers looking to get the jump on competitors. And now we have another batch of 2019 predictions to enjoy, this time from Shutterstock. The company put together an infographic (haven’t heard that word in a while, huh!?) as a guide to visual styles that will be popular this year. Again, this is based on billions of searches. If you have time, have a good look below. If you’re currently snoozing reminders for meetings due to start in a few minutes, here’s a quick overview. When you write a weekly social/digital news roundup, you soon learn to sniff out non-credible rumours and speculation. Some unverified claim or other is always doing the rounds; generally they create a bit of panic that dies down pretty quick. Occasionally though, these inaccurate statements catch on and go viral. Even more occasionally they turn out to be true. It’s super difficult for users to know the difference. A sure sign a claim is turning into a problem is when the platform in question actually steps in to shoot down misleading accusations itself. 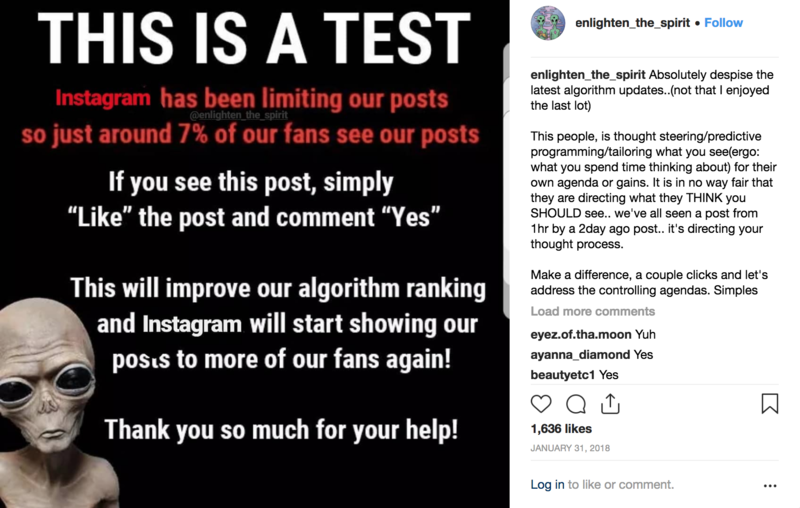 In this case, posts claiming Instagram limits reach to only 7% of followers caused a right old kerfuffle. Future note: I generally wouldn’t trust any “facts” delivered in the above font and/or featuring an alien. Anyway, clearly people were concerned enough about this to warrant an official Instagram response. As you can see, the company was keen to reassure users that all posts will eventually be seen if you continue scrolling. It also revisited how the algorithm prioritises content. It’s well known that kids and teens flock to the likes of Snapchat and Instagram over Facebook these days. The main reason? They’re more fun. If you need any evidence, just take a look at this recent Snapchat report highlighting the variety of emotions users feel when using each platform. 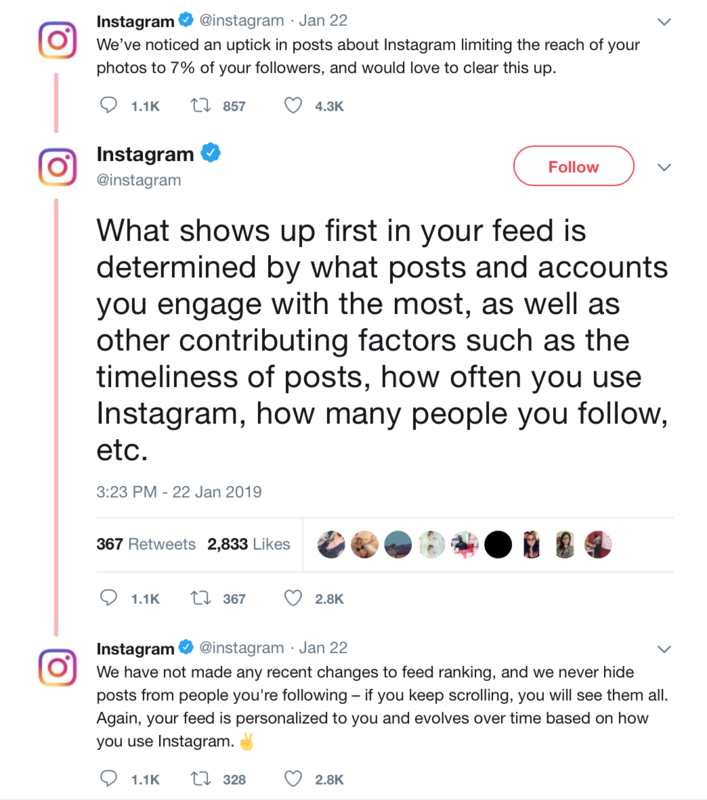 Look, it’s fair to say that Facebook and even Twitter serve a different purpose from Insta and Snap. Yes, there’s fun and engaging content published on both – lots of it actually. But they are also domains where tons of news is shared, serious issues are discussed and interactions with brands are important too. Anyway, with all that being said, Facebook is now on a mission to become super popular with the youngsters once again. The plan: as revealed by Tech Crunch, a new feed dedicated to funny viral videos and GIF-like clips. Facebook has confirmed it’s running a small-scale private beta test of LOL with around 100 high school students. There’s no news yet on if/when it will be fully rolled out. 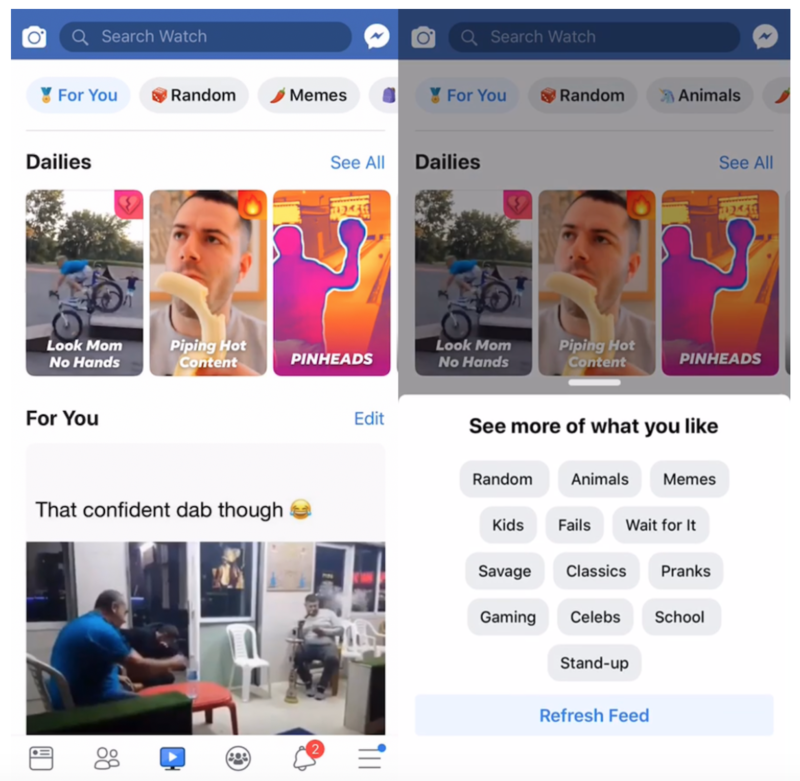 Facebook IQ – the platform’s insights unit – has just released The 2019 Topics & Trends Report. Just like the Shutterstock predictions mentioned above, Facebook has looked at conversation topics seeing growth in 2018 to anticipate what will matter to people this year, and also to predict shifts in the world around us (not just on Facebook). Findings have been grouped into 7 categories: Beauty & Fashion, Commerce, Entertainment, Food & Drink, Mind & Body, Science & Technology, and Travel & Leisure. Here are the 7 insights I found most interesting. While all these predictions are useful, marketers can easily get overwhelmed. My advice would be to look for common themes from 2019 insights across all platforms, and see which one or two would work as focus points for your brand. Responding to shoppers’ ever-evolving preferences and interests quicker than your competitors is a great way to get ahead. Facebook partnered with PSFK, Stylus and The Innovation Group at J. Walter Thomson Intelligence to produce the report.